I have many folders in Mail that I would like to move out of that application but keep for future reference. I’d like to keep them similarly organized to the way they currently are within Mail. Could you describe an efficient process for moving a hierarchy of folders (e.g. from a recently completed project) to Documents or Dropbox or Evernote or some other repository? Examples would be a home remodeling job involving multiple contractors and suppliers or a wedding with multiple vendors. This can be done quite easily. Create a mailbox (choosing to save it to your Mac rather than iCloud) for each project and drag the appropriate messages to each one—so, your remodeling messages to a New Kitchen folder and wedding-related missives to the Here’s Your Dowry folder. Create a master folder for these folders, call it something like Archived Export, and place the project folders into it. Select the master folder and choose Mailbox > Export Mailbox. In the sheet that appears choose a destination for the archive that will be created and be sure to enable the Export All Subdirectories option. Click Choose to export your folders. Because you chose to export all subfolders, two items will be saved—one bearing the name of the original folder followed by .mbox (so, in our example, Archived Export.mbox) and a folder, that’s also named after the master folder (Archived Export). Inside this folder you’ll find mbox files for each folder that’s within the master folder—New Kitchen and Here’s Your Dowry, in our case. You can then save that master folder wherever you like. Now, to what I suspect is the meat of your question—viewing those messages in the future. Technically, you can open mbox files in a text editor, but if you care anything for clarity, you won’t. Not only will you see the body of each message, but all the hidden header information as well. Only a masochist would try to read messages this way. Instead, use an application best suited for reading such messages—an email client. When discussing email annoyances last year, I outlined how I do this. Although you could reimport these messages into Mail I suggest you use Mozilla Thunderbird for this purpose. I see little logic in cluttering up Mail with these things again. 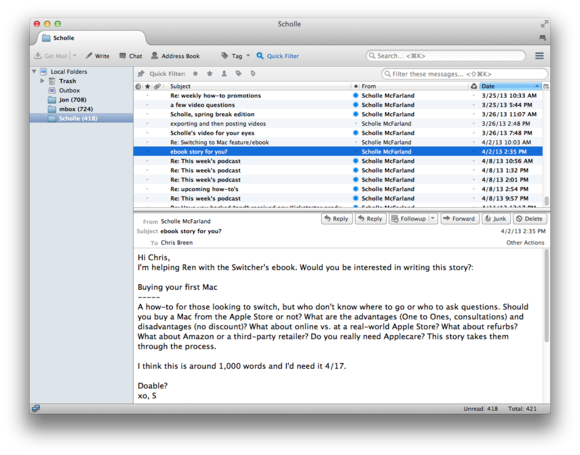 Instead use a different email client whose purpose is only for reading archived messages. Thunderbird is free and, with the help of an add-on, able to import mbox files. Download and install Thunderbird. From the Tools menu, choose Add-ons. In the Add-ons search field, enter ImportExportTools. Click the Install button next to the add-on that appears. Thunderbird will download and install the add-on. Click the Restart Now link to restart Thunderbird. From the Tools menu choose ImportExportTools > Import Mbox File. In the sheet that appears, enable the ‘Select a directory when searching the mbox files to import (also in subdirectories)’ option and click OK. In the resulting window select the master folder (not the .mbox) that you’ve exported from Mail and click Choose. You’ll be asked to affirm that you want to import each mbox archive within that folder. Choose to. (You can also enable the “Don’t ask me again” option and the remaining mbox files will be imported without need of your confirmation.) Each folder archive will be imported into Thunderbird and bear its original mbox name—mbox724, for example. Feel free to rename these items. When you later wish to revisit these messages, just launch Thunderbird and choose the appropriate archive.